I'm pretty sure that I once wrote a review for this movie back when Multiply was still a thing, but it seems I never got around to cross-posting said review over here. I thought I had written one already given I went through a Nia Vardalos phase with movies like My Big Fat Greek Wedding and My Life In Ruins, but still I can't find this one among the reviews on this blog. So here I am writing a new review for Connie and Carla, primarily because I love this movie so much. Yes, this totally needs to have a spot on the Geeky Guide. And if it turns out there is a much older review of this movie buried deep among the other stuff, well, I'm good for having more than one review of this super fun movie. And I've slotted this review in my Sunday LGBT slot because of the fact that the fabulousness of drag queens plays a central role in this movie - and that's a great thing. Most people simply see this as a comedy and not necessarily a "gay comedy" which is more like the end state that we want for all of LGBT movies out there. 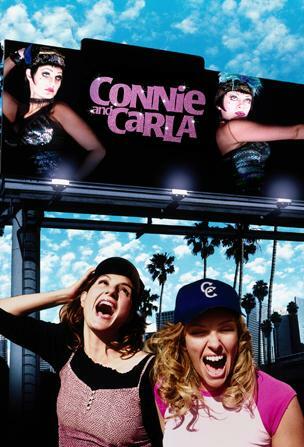 Synopsis: Connie and Carla is a 2004 comedy movie directed by Michael Lembeck with a screenplay written by Nia Vardalos. I have lost track of how many times I've watched this movie. Connie (Nia Vardalos) and Carla (Toni Collette) are two childhood friends who remained determined to somehow make it big in musical theater. And while they remain optimistic, their options are pretty limited given they're only performing as a two-person dinner theater act at an airport lounge in Chicago. And things take a turn for the worse when they accidentally witness a mafia hit. Fearing for their lives, they leave the state and make their way to California thinking that it's the last place anyone would look for them given their love of theater. They try various jobs but ultimately are unable to get into the California life. But things change when they learn of an open mike night at a local club. However it's actually a gay club that features a drag revue as its central production. Thus Connie and Carla try to post as drag queens in order to get the job. Their main edge - these girls can actually sing. This movie combines too things rather close to my heart - musical theater and drag queens. And the pacing of this movie along with wonderfully witty writing is really what helps keep things moving along. The very reason for them moving down to California is because of how it's supposed to be a place with no sense of culture at all. It's silly and offensive even but it just works. And credit really needs to go to Vardalos in terms of her ability to spin a great story with good humor. Vardalos and Collette together make for quite the adorable pair. Their on-screen dynamic is just delightful and you totally get that vibe that they two of them are truly good friends. And whether that is just about acing skill or indicative of something else is really up to you to figure out. And their characters are only enhanced by the equally hilarious drag queens drawn into the production. Individually, the "Belles of the Ball" aren't all that amazing, especially given the many drag queens I've encountered over the years. But as an ensemble they're just hilarious and they really worked well together They're certainly crazy in their own way but having them pretty much vying for Connie and Carla's attentions makes for some delightfully campy craziness. And yes, this review won't be complete without proper mention of David Duchovny's role as the male love interest in the movie. I've never really seen his appeal as an actor, but admittedly even I found his rather adorkable nature quite endearing. And he performed his dual role of love interest and straight character sort of depicting the challenges of bad coming out experiences in the family. Connie and Carla makes me want to sing along or just genuinely laugh out loud without inhibitions. Maybe I love it because of the fact that to appeals to so many of my interests, but I'd also like to think that it remains to be a genuinely funny movie. Thus for me it gets a good 4.5 crazy Broadway musical references out of a possible 5.